Jennifer Raven is a photographer, writer, teacher, single mother of twins, and cancer survivor. Her photography show Metamorphosis~body of work includes self-portraits before, during and after treatment for stage three invasive breast cancer. Metamorphosis was exhibited at the Afterglow Arts Festival in Bridgewater, Nova Scotia, in 2013. Two years later, Jennifer turned to comics to tell her story. Adventures of Cancer Girl, illustrated by Denise Gow-Morse, portrays the daily life of single mother with cancer. As Jennifer writes: single mother + cancer = superhero. Understorey Magazine: Why did you move from photography to comics to tell your story? Jennifer Raven: I think photography and comics engage different audiences. Metamorphosis may be my life’s work. I don’t know how I will ever be able to create a more complete and powerful group of images. But while a picture might be worth a thousand words, it doesn’t allow me to talk directly to my audience. Comics were a strange choice for me; in general, I’m not much of a fan. But Cancer Girl allows me to explore the very bizarre lifestyle one slips into after a cancer diagnosis through the lens of my own dark sense of humour. I hope it will help de-stigmatize breast cancer and contribute to greater awareness and dialogue. UM: As a single mother and cancer survivor, do you actually feel like a superhero? JR: Going through cancer treatment, I felt like anything but a superhero. My cancer coincided with an emotionally abusive relationship, which ended soon after I finished treatment. At that point, I felt like I had survived a war. Looking back, it hardly feels real and sometimes I think I forget, until I look down and see my own scar. I still can’t imagine my daily life in the months before my diagnosis: getting “twinfants” up, diapered, dressed and fed; getting my six-year-old ready for school; commuting work three days a week; grocery shopping on the way home; picking up the kids; making supper; and getting everyone to bed. Two years after treatment, I thought I was fine until one day when I had a mammogram. Staring down that machine again, I had a panic attack and started to cry. I was shell shocked. It has now been more than three years since my last treatment and I still experience post-cancer fatigue. But when I look back at what I lived through, I feel like only a superhero could have done all of those things. I think all single mothers deserve the title of superhero. My mom certainly does. UM: What can be done to help other women, especially single mothers and women battling cancer, to feel more heroic? JM: Connecting with others who are going through the same thing. I didn’t really do that until quite late in my treatment, and that left me very isolated. One thing I did do was make a point of dressing well and looking my best whenever I left the house, even if I was just going to the Cancer Centre. I may have spent eighty percent of the time in my pyjamas, but I tried not to let the fatigue show on the outside. I think it gave me back a bit of my dignity and sense of control. I think all of us need to search inside ourselves for our inner superhero. UM: Where do you get ideas for Adventures of Cancer Girl? JR: Most of the strips are autobiographical. Those that aren’t from my own experience are mostly things I wish I’d thought of when going through treatment. UM: Tell us about your collaboration with artist Denise Gow-Morse. JR: When I was first diagnosed, I had just written a children’s book, Boo-Boo Baby. It had received a number of rejections so I made a decision to self publish and went on a hunt for an illustrator. I was blessed to be introduced to Denise through a friend. We work very well together and had actually completed a second project before I asked her if she would be interested in bringing Cancer Girl to life. She has her own web comic called How My Mom Sees Things, which I really enjoy. She was a natural choice. UM: How has Adventures of Cancer Girl been received so far? JR: We’re still very new so we don’t have a huge audience yet. But it is growing. I am truly gratified that other cancer patients and survivors have related to the strip and have given a lot of positive feedback. 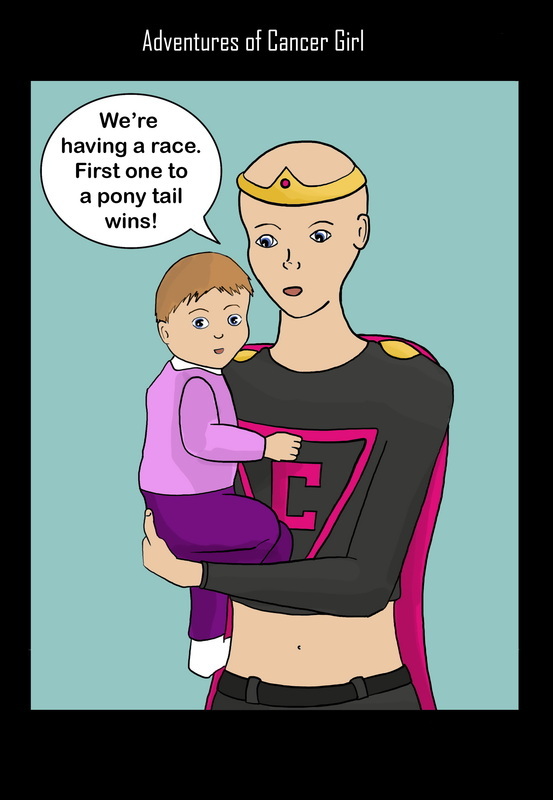 UM: What do you hope for Cancer Girl, both the comic strip and the woman in it? JR: I don’t see Adventures of Cancer Girl just as a strip about cancer, although that part is always there. Cancer never happens in a vacuum: it comes unannounced and invades our ongoing lives. Thankfully for many, cancer is a temporary condition but, like a divorce, you are never the same afterward. As a comic, I hope for wider syndication and I see that happening already. I am hopeful we will have Cancer Girl at the next Hal-Con, and I will be making an appearance in an upcoming issue of a national breast cancer magazine. We definitely need Cancer Girl t-shirts! As for Cancer Girl herself, unfortunately, I don’t think she will ever be cured, but I hope she can show us ways to laugh in our darkest moments and make it through the most stressful events in our lives with dignity. Read more of the Adventures of Cancer Girl.